The ‘Braille’ on the bills is incorrect; $10, $20, and $100 all use the same arrangement of dots, and on the $20 and $100 they’re even in the same position on the bill. What the font used here? This is a very interesting take on the US paper money… with strong echoes, it seems to me, of the new UK coinage, where the coins come together to make a single image. Very clever, beautiful in an unusual and creative way, and you’ll satisfy a ton of people with the $1, anachronism though it is. 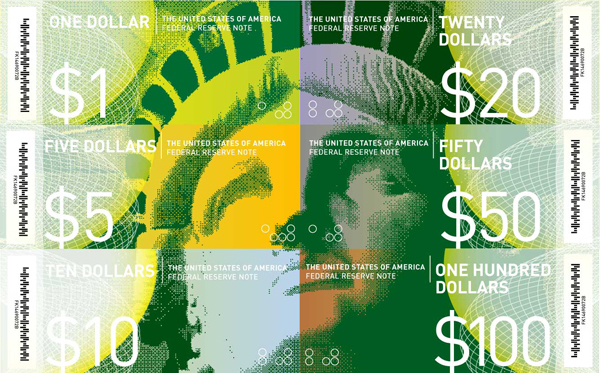 I would like to see your ideas for the back… and more globally, I would like to see this remarkable idea of a true redesign of US money come to something more than an exercise. Living in Canada, where our money has gone through a number of changes in the 30+ years that I’ve lived here, and having spent time with the euro and the Australian dollar, this seems really, really overdue. Hideous. Who wants a bar code on damn currency like a postcard? The florescent green is HORRIBLE. Extremely well designed notes. Any new money absolutely must be machine readable – the bar code is probably the best way to achieve that. Agree that with some more work, it could actually fly. I can just see it: "I’d like 186 dollars in a hundred, a fifty, a twenty, a ten, and a five." Next Next post: Dollar Coins are Bad : A ‘Conspiracy’?